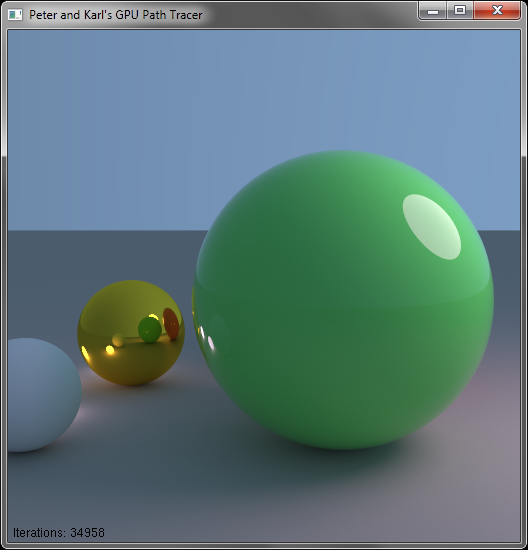 This post is the second update for the GPU Pathtracer project! Since the last update, Peter and I added an interactive camera to the renderer to allow realtime movement around the scene! We also had our Alpha Review, which went quite well, and Peter implemented a reflection model. Initially the reflection model used was Schlick’s Approximation, but later Peter replaced that with the full Fresnel equations. I also added super-sampled anti-aliasing for a smoother image. Interactivity and Moveable Camera: We can move around the scene! Check the posts for tons of details, images, and even some video!